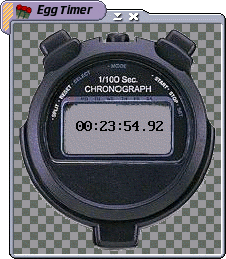 Egg Timer is a simple program hacked out in 2 hours to act as a, um, egg timer. ... I got nothin'. Mouse scrollwheel adjusts time, left button turns counting on and off. It uses the SDL and SDL_image libraries, and is licensed under the GNU General Public License.